Put in Bay Cheers the Cleveland Cavaliers! The Cleveland Cavaliers completed the unimaginable on Sunday night… a 93-89 Game 7 victory over the Golden State Warriors to win the franchise’s first NBA championship. No team in 32 tries had ever come all the way back from being down 3-1 to win the NBA Finals. 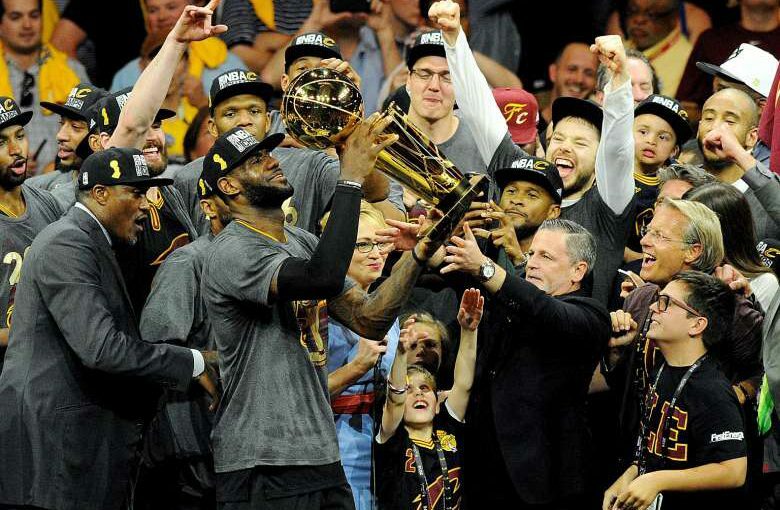 LeBron James, Finals MVP, has now delivered Cleveland’s first professional championship in 52 years. He led all players in this series in points, assists, steals and blocks. He gathered 27 points, 11 rebounds and 11 assists. The Warriors defeated the Cavs on this stage a little over a year ago. The Warriors had a 73-win regular season. This has all gone to waste. The Cavaliers prevented them from capturing what truly mattered. An 11-4 run ignited by six points by Draymond Green in the final four minutes of the second quarter helped the Warriors close the half strong. The went into intermission with a seven-point lead. That was the biggest of the game for either team at that point. It was back and forth throughout the final 12 minutes, as The Finals finally got the nail-biter everyone wanted. The Warriors led 87-83 after a Green jumper, but James rattled off six straight — three free throws and a trey — for an 89-87 advantage with 4:53 left. Golden State tied it, but never got the lead back. Cleveland gets the win! Just got back from the parade downtown… WOW! Never been in a crowd that big before. Utter pandamonium and fun! The parade was fun. And long. Very long. But there was confetti. Players danced. LeBron James spoke. J.R. Smith strolled around shirtless. Richard Jefferson un-retired. Jim Brown made an appearance. The Ohio State marching band tooted their horns. For those who missed it, LeBron James and the rest of the NBA champion Cleveland Cavaliers were honored with a downtown parade today as the city celebrated its first major professional sports title since 1964. 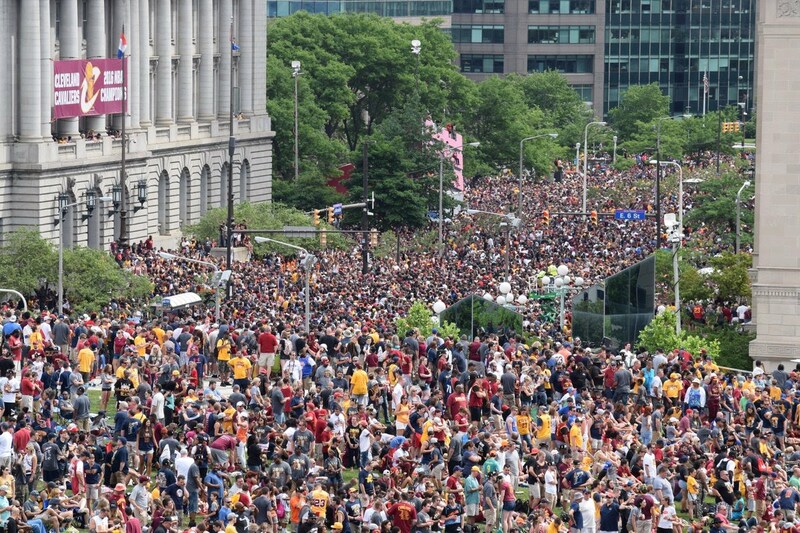 A crowd of approximately 1.3 million, some who had slept on sidewalks overnight to get a good view, packed downtown Cleveland like never before, spilling off sidewalks into streets along the 1.5 mile parade route that took more than four hours to crawl through, concluding with a rally at Mall B. Yes, that’s right… 0.375 miles per hour! It was THAT crowded! The parade, which featured 60 floats, began with a truck spraying confetti into the crowd and was followed by Ohio State coaches Urban Meyer and Thad Matta and the OSU marching band. Not far behind were the Lake Erie Monsters, who won the AHL’s Calder Cup this season, and of course the Cavs dancing girls. Fans stood on rooftops and portable toilets, and hung out of office building windows hoping to get a glimpse of James, who rode in the Rolls-Royce convertible with his wife, Savannah, and their three children. Near the start of the route and just feet from where his iconic, 10-stories-tall banner hangs, James, wearing a gold cap and chomping on a cigar, stood and posed with his arms outstretched just as he does on the giant mural. That just happened, Cleveland… THAT JUST HAPPENED! And who knows, you may even see some of the players up on the island again this year. There have been Cavalier sightings in the past (as well as Browns and others). To book a vacation rental home or condo, or just to check availability, please call 216.898.9951 or visit www.islandclub.com and WE’LL SEE YOU AT THE BAY!